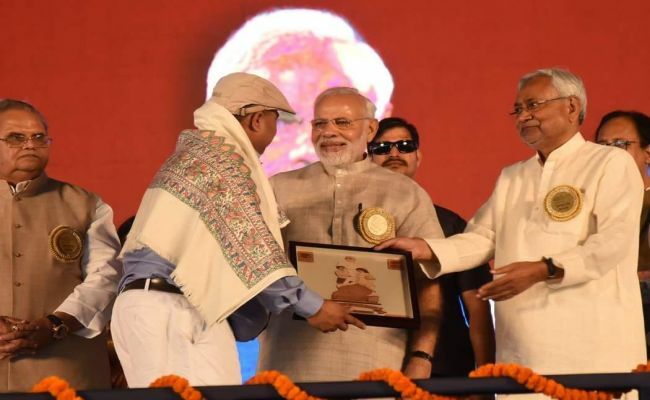 A 47-year-old teacher from Bijnor district of Uttar Pradesh was felicitated by Prime Minister Narendra Modi for his contribution to the Swachh Mission. Here’s how he brought in a mass behavioral change. 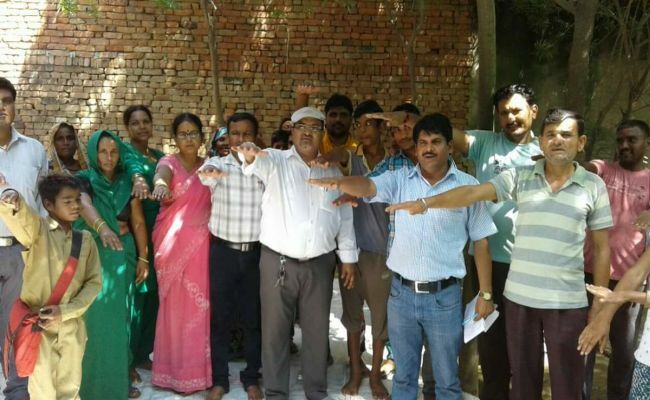 “Times are changing….what was once referred to as a ‘toilet’ is now being addressed as ‘Ijjat Ghar’,” with this very hope and motivation, 47-year-old Ateeq Ahmad, a resident of Bijnor district, Uttar Pradesh started his swachhta initiative in 2016. A teacher and professor by profession, Mr Ahmad revolutionised the concept of using a toilet over the period of three years in his home district of Bijnor with the help of just one powerful tool – behavioral change. From writing poems and songs, directing short films, designing posters to personally making door-to-door visits, Mr Ahmad reached out to innumerable people and successfully made over 15 villages free from open defecation. For his outstanding contribution to Swachh Bharat Abhiyan, Mr Ahmad was felicitated in the national capital by Prime Minister Narendra Modi in an event titled ‘Satyaghraha se Swachhagraha’ on April 10 this year. My journey of cleanliness has been challenging, exciting and most importantly fruitful. I feel extremely honoured on receiving a token of appreciation from India’s prime minister. I have vowed to work in the field of health and sanitation till I die. The road to cleanliness was certainly not easy for Mr Ahmad. The real work lies in behavioral change and its sustenance he believes. 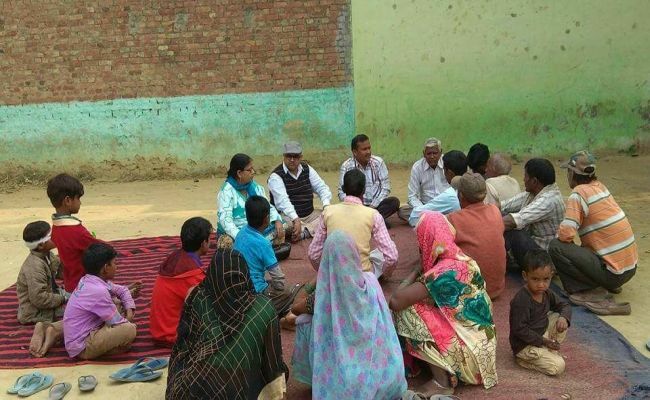 From associating dignity with toilets, coming out with creative and emotional write-ups, getting ostracised by neighbours and friends to travelling thousand miles to broadcast his district’s tremendous journey, here’s how the swachhagrahi helped Bijnor improve sanitation. For most of his life, Mr Ahmad has been into the teaching profession. An expert on various topics, he taught Math, Science and Social Sciences for nearly 15 years to the students in primary school and took environment classes in a local college. He was also the block co-ordinator for Swachh Shiksha Abhiyan. So what made him quit teaching and enter the sanitation field? I have always been passionate towards the cause of cleanliness and hygiene and propagated the same to my students. When Swachh Bharat was launched I decided to put my thoughts into practice and bring a difference in my district. Seeing the plight of the Bijnor villagers, Mr Ahmad thought that the only way to bring a difference is by being a part of the system. After clearing exams for the post of Swachh Bharat Zilla Parishad Prerak, Mr Ahmad started executing his ideas. In the role of the Prerak, who is a link between the government and people, Mr Ahmad delivered effectively. Most of the families know me because of my profession. They were willing to listen to me. And I took advantage of this very fact to expand the reach of cleanliness mission, he adds. Mr Ahmad believed that associating toilet with respect would lead to people being more acceptable to having toilets inside their houses. Most of the houses in district either have toilets outside their housing premises or not have it at all. People do not feel right in having a toilet under the same roof where they eat food. And to break away from this notion, we decided to change the whole perception towards toilets. Calling it Ijjat Ghar, which literally translates to ‘House of Dignity’, worked in our favour, says Mr Ahmad. The women are forced to go in the fields early in the morning to relieve themselves. This would not only endanger their health but also jeopardise their safety. Hence construction of Ijjat ghar aka toilets were plugged to women’s safety, he adds. Every toilet constructed since 2016 has the term ‘Ijjat Ghar’ carved on the toilet doors. This initiative was even hailed by Prime Minister Modi in his monthly radio show Mann Ki Baat. It does not come as a surprise that Mr Ahmad made children anchors of the movement. Having dedicated over a decade in empowering children through education, students and teachers came forward to do their bit for their professor. While teachers devoted extra time to the class to teach about safe hygienic practices and the importance of toilets, students led small movements in their neighborhoods. 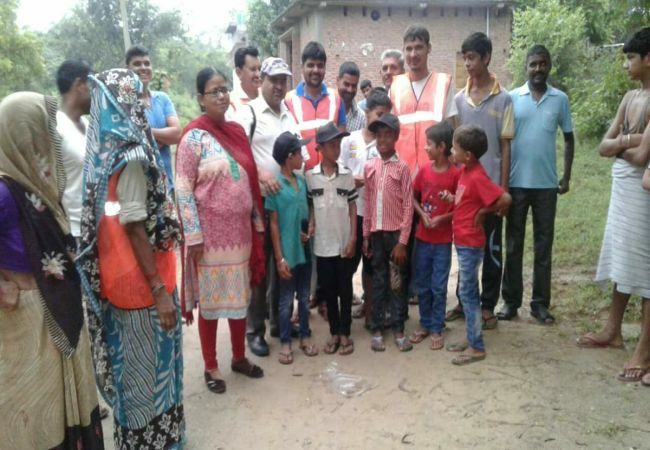 From inspecting open defecation spots in the wee hours of morning to fighting with their parents to build a toilet at home to appearing in short films by the government on sanitation, students of Bijnor district actively participated in the Clean India Mission. And besides, parents often gave in to the demands of their children says Mr Ahmad. In order to reach as many people as possible and in an effective way, the highly talented Mr Ahmad composed songs, directed short films, made poems and even wrote an entire book on sanitation which will soon be published by the Uttar Pradesh government. Songs were pegged to different occasions and festivals as well, “The aim was to give an emotional angle to Swachh Bharat by linking messages with the festivals. Short films are shown in school, circulated via WhatsApp, poems have been included in the academic schedules, and songs play on local radio stations. “We often tend to remember to messages that are entertaining. And thus I came out with several creative channels that would appeal people, especially the youth,” explains Mr Ahmad. Be it daughter or daughter-in-law, whenever she defecates in open she puts her life and dignity at stake, lets put an end to this shameful practice and vow to build a toilet at home, reads one of the lines from his poetry collection. “In my training session on Behavioral change, we were specifically told to categorise our targets. For instance, have a separate campaign for women, children, elderly and men. This would make our work easier and it did. However, it had its own share of problems,” says Mr Ahmad. Educating every group individually consumed a lot of time and hence the toilet construction activity went on in a slow pace in initial days. However the perk was that now every member of the family was convinced to end open defecation. Majority of the families even returned their toilet subsidy and opted to use their own money to build toilets. Over Rs. 4 crore were returned to the state government by the families residing in the villages where Mr Ahmad spearheaded the campaign. Once a particular village would turn open defecation free (ODF), the next challenge would be to sustain the tag. Mr Ahmad goes to every household of the ODF villages to bring the attitudinal change. 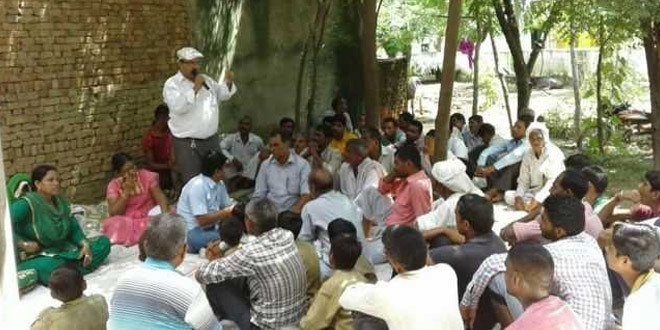 On gaining the ODF title, Mr Ahmad also organises ‘Walk of Pride’ for the villagers to make the process eventful. Now that Mr Ahmad has been successful in achieving his personal goal of making 15 villages ODF, he plans to venture into the Namami Gange project that aims at purifying the holy Ganga river. He also plans to get in touch with his fellow awardees of Swachhagraha and carry out this noble initiative in other parts of the country. “I have been in touch with the people who mastered the art of sanitation in their own regions. And we would be open to help any NGO, Self-Help Group, organisations located in any part of the country,” signs off Mr Ahmad. Next Post: 70 Residents From Bengaluru Transform A 6-Year Old Wasteland Into A Kabaddi Ground In 12 Days.